Why did you blur your username, RP and avatar though? Haha, I've heard about a third leg, but a third arm ... that's news! I tried resizing it but somehow it refuses to use my resized version of the picture. I am definitively going for the SV version - 43 Dmg @ 610 rpm, and stable as an AR, eff yeah. On a different subject, I anonymized that pic 'cause I can't stop nobody from reposting it somewhere else, and I don't want my name all over the place because reasons. 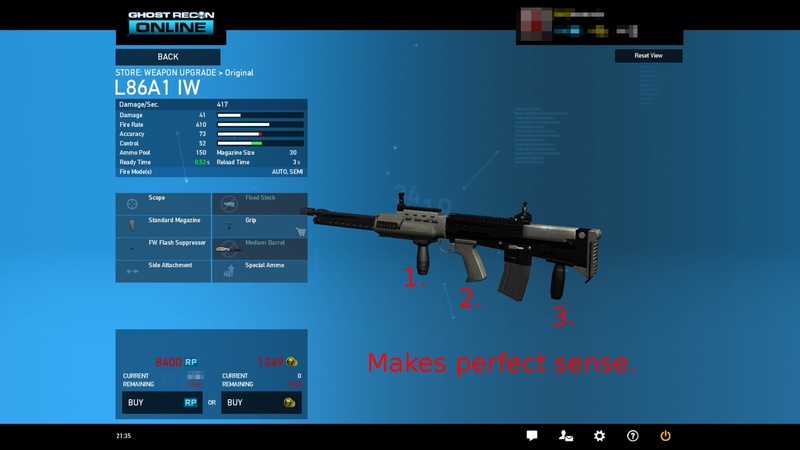 Although you do have a point saying a gun isn't all that matters, and that skill is more important, I do notice that I preform better using the Sentinel SR-I SV than the standard issue SR, and that the PP-19 SP is better than the usual SMG. I think the point of this post was more pointing out that three hands always beat two I would say that all and all this is a pretty decent gun, although a 30-bullet magazine would seem a bit limited compared to the 53 I'm now used to. I didn't say it was terrible and useless, not at all, just that I prefer my current set-up with higher damage per shot, a better scope and an awesome crit-rate (yes yes, that could also have been the case for the standard sr) I'm currently doubting whether or not I should buy the M200 I was planning to buy or not, since it will take quite some time to get to level 7 again. "Progress for the sake of progress should be halted"
To add to the ongoing debate, well, firstly those 53 SMG rounds are fired much more rapidly than my 30 AR or LMG bullets - I guess it takes both of us the same time to empty a magazine. Also, my bullets are bigger, meaning they do more damage - two or three shots from my AR will kill most anything, it might easily take twice the number of rounds from an SMG. Skill does of course matter, as in for example knowing the right spots to be in where you have cover and a clear field of fire etc, and your familiarity with your favourite gun will make you much more efficient. BUT, if your favourite gun happens to be an M27, (or an M24GI for our snipers here), you are still fvcked if you have to go fight an F2000, or an SVDS, or an MG36SV (can't remember the lvl30 LMG, but you get the idea). Also, as Mortem said, crit rates. When used to one gun, you get the most awesome crit rates out of it - that's why I as lvl 20 assault still play a lvl 10 gun, because of that 20+% chance that it will cause 100+ dmg one-shot-kills. As to the "high velocity breadcrumbs", you should have learned (will learn?) in physics that force F kinetic energy (and hence damage) is equal to 0.5 times the mass of the object (breadcrumb) times the velocity TO THE SECOND POWER which is huuuge. Let's say you accelerate a breadcrumb, mass = 1 g, to the speed of sound. which is the equivalent of over 5kg. That is quite a lot for our 0.001 Kg breadcrumb, isn't it? Also, this force is concentrated on a very small area, because breadcrumbs are small, so the pressure it creates will be even greater. Yeah I am a nerd. my last physics class has been a while ago. Post has been fixed, wrong stuff and new stuff. Newton clearly stated Force is mass times acceleration. You mentioned the formula for Kinetic Energy, 1/2 * m v². And that is why I don't study Physics but Maths and Computer Science. Since Newton is an other term for kgm/s², we can just multiply the mass of a 7.62×51mm NATO M118 bullet (as fired by the M24 SWS) in kilograms by the decelleration of the bullet upon impact (let's assume this to be from muzzle velocity to standstill over a period of 0.01 seconds). In figures this would mean 0.0097 (9.7 gram bullet) * 85000 (850 m/s muzzle velocity per 0.01 second) = 824,4 Newton so about 84 kg actually! (Note that the 0.01s is an estimation since I couldn't really find decent literature on it) since the crossectional area of the bullet at the widest point is 4.5 cm² we are facing a pressure of over 1.8 MILLION Pascal, about 18 atmosphere on your skull. ADD: 0.01s was based on my own thought of it being in the range of 0.1s and the sources I did find stating that in a hard substance such as plastic it would be 0.0017 seconds. Since you initially have the hard skull, which quickly decelerates the bullet, then the softer brain tissue, I thought the value would be higher than the value I found, but deceleration seems too be faster than I imagined initially. wtf are you guys talking about here ??? You guys are actually using PHYSICS?! Indeed, it is very much. There is a "2" in that equation - this can't be right. Maths to me is more like "Proof this", or "Is that statement true for all rational numbers? How about complex numbers?" and it's all greek letters... fun though. The greek letters we come past are usually chemophysical constants etc. ADD: Shall we get back to the topic?